We have all been there; the work day gets off to a rip–roaring start and there is no letup in sight. Then it’s 3pm, and the fatigue starts to set in. Everyone’s making a beeline for the hospital’s coffee pot for an afternoon pick–me–up. But, remember, exercise can be just as powerful, if not more powerful when you need that afternoon boost. No gym available? No problem. That’s where calisthenics play a role. Calisthenics are strength exercises done without any special equipment and their primary advantage is the flexibility and ease of practicing in any place, at any time. All you need is a couple square feet of space and you can practice these exercises in between appointments to stay energized. One of my favorites. Begin in a standard plank position (palms of your hands on the floor, directly under the shoulders—slightly wider than shoulder–width apart—like you’re about to do a push-up) but modify it so your legs are slightly wider than your body and your hips are high in the air above your head. Tighten your abs and recruit your shoulder muscles as you lower your body and rock forward in a gentle body arc. Do this while you’re lowering your hips back down to normal position. Repeat 15 times while keeping your abs tight until the next appointment is ready. These are perfect because they work your legs, help your posture and increase your heart rate. After a few sets of these, you will feel charged and ready to go. Stand up straight with your feet slightly wider than shoulder width and your toes slightly outward. Bring your shoulders together like you are squeezing a tennis ball between your shoulder blades, keep your abs tight and squat until your knees break 90 degrees. Your arms should come straight out in front of you as you do this movement. Then stand up slowly to the starting position. Try as many as you can in one minute, using a controlled explosive motion. This exercise recruits your legs, abs and arm muscles while working on isometric, concentric and eccentric movement. 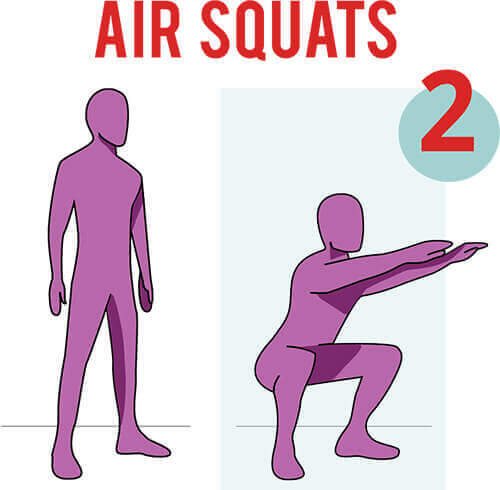 Assume a squat–style stance with your back flat against a wall and knees at 90 degrees. Contract your chest muscles tightly as you slowly press both palms out in front of your chest for a count of 3 seconds. Then, raise both hands simultaneously above your head so your arms form a wide V. Slowly pull your hands down as you contract your back muscles until your hands are at your shoulder height. Repeat the arms movement while you are in the seated position as many times as you can in one minute.